When you compress a file or folder in Windows 10, its icon will have a double blue arrows overlay at the top right corner to indicate that it's a compressed file or folder. If you encrypt a compressed file or folder, the file or folder will no longer be compressed afterwards. If you compress an EFS encrypted file or folder, the file or folder will no longer be encrypted afterwards. This tutorial will show you how to customize or remove the double blue arrows icon overlay on compressed files and folders for all users in Windows 10. You must be signed in as an administrator to be able to change or remove the double blue arrows icon overlay. If you have a custom 24x24 pixel .ico file you would like to share, then please feel free to upload and post it here. 1. Press the Win+R keys to open Run, type regedit, and press Enter. If you do not have the Shell Icons key, then right click or press and hold on the Explorer key, click/tap on New, click/tap on Key, type Shell Icons for the name, and press Enter. 4. Do step 5 (change/remove) or step 6 (default) below for what you would like to do. Other than uncompressing the file or folder to remove the double blue arrow icon, you can customize the icon to what you like below. If you do not have the 179 string value, then right click or press and hold on an empty area in the right pane of the Shell Icons key, click/tap on New, click/tap on String Value, type 179 for the name, and press Enter. 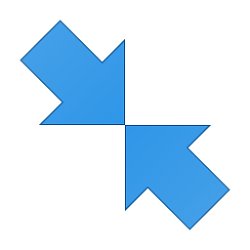 If you like, you can download and use a 24x24 pixel transparent.ico file here that will remove the double blue arrows icon. Be sure to unblock this transparent.ico file before moving it into your C:\Windows\System32 folder. 7. Restart explorer to apply. 8. When finished, you can close Registry Editor if you like. Thank You Shawn for this. So I gathered so far that Value "29" here is for removing shortcut arrows and "179" is for Compression arrows. now, could you find the value for yellow lock icon overlay for efs file and folders? it's just as much annoying as those double arrows if not more. Hello Axims, and welcome to Ten Forums. thanks, my money's on you! many thanks, and happy new year to you too! Brink, I followed the instructions of your guide to a t and now instead of blue compression arrows I have blank white pages. Did I do something wrong? Did you use the transparent.ico in the tutorial, or a custom .ico of your own? Did you unblock and save either one in the C:\Windows\System32 folder?